MANGOS! Or is it mangoes with an “e?” Jury is still out on that one (grammar folks help out on this one). Anyway, mango season is upon us! Every April, May and June this wonderful season takes over, particularly for Indian and Indian-American households who are mango-crazy. When I say crazy, I mean crazy! Whole festivals are created around this fruit in India. It is sometimes called the hundred days of madness, in fact, in reference to the brief amount of time this prized fruit is in season. My parents came here in the 1970’s and one of the things they missed most was the Indian mango. My mom would tell me stories about how my grandmother would spend time pickling unripe mangoes, setting the jars out on the veranda so that the hot Indian sun would work its magic, heating the jars and preserving the newly jarred jewels. I also have childhood memories of my parents, once they finally found mangos in this country, eating the juicy, fleshy, fruit over the sink because it was so messy! Every Indian-American kid probably has the same memory. But it isn’t just Indian folks who have a fondness for the fruit. Caribbean and Mexican cultures adore the fruit as well. The only debate is over which mangos are tastier. True Indian mangos, called Alphonso mangos, have been denied an entry visa for years from the US government (something to do with pesky insects they carried) until recently (they can be found for way too much money now in Indian grocery stores). 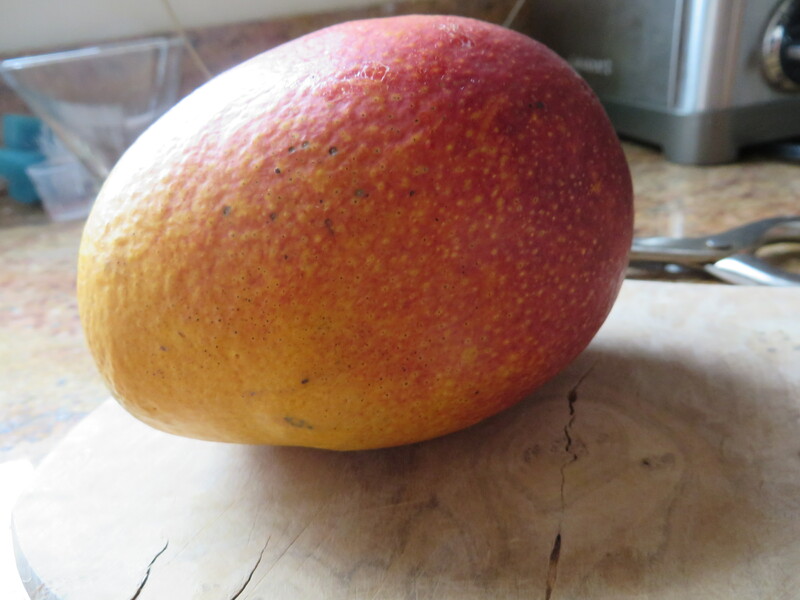 Other mangos, like the Kent and Ataulfo varieties are more commonly found in US markets and are grown in Florida and Mexico. These are just as tasty when ripe…look for sweet-smelling, soft fruit when selecting. 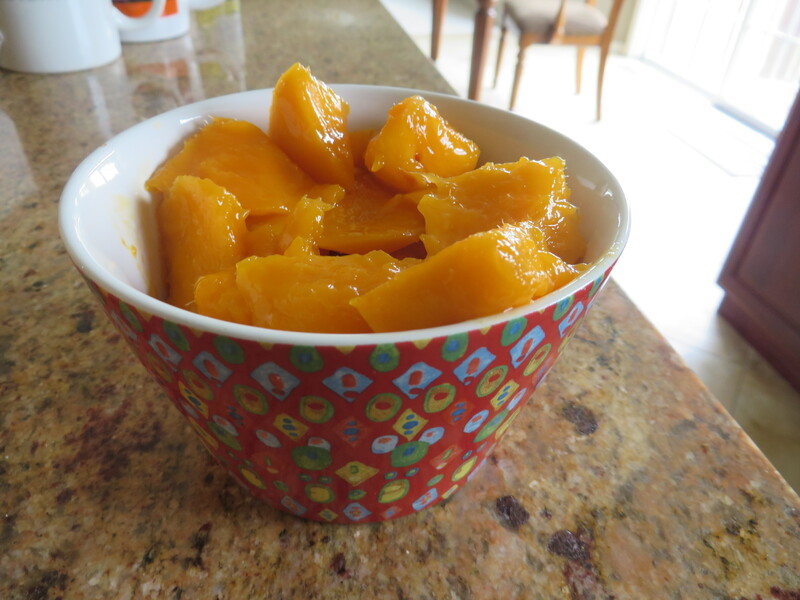 If your baby is lucky enough to be starting solid foods during mango season, this is an amazing fruit to try! Simply cut into chunks and blend until smooth. 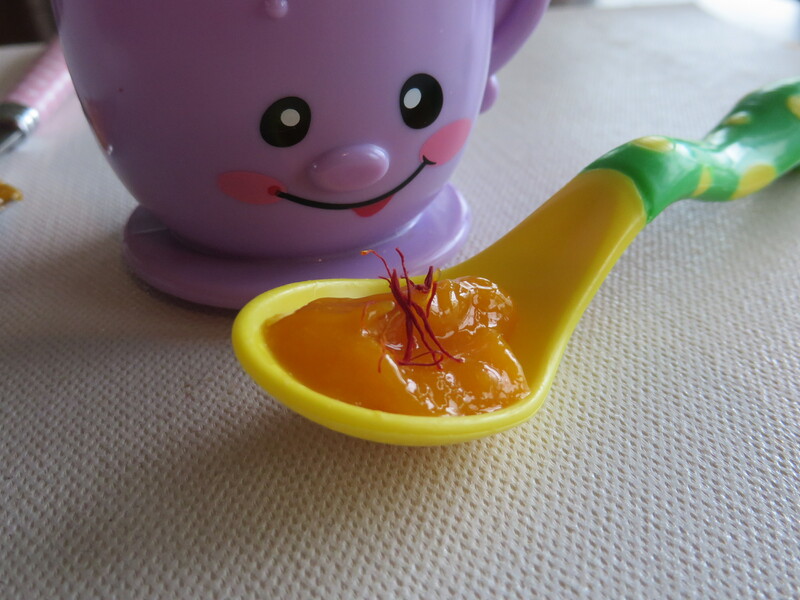 Mr. Teacup takes a taste of mango saffron puree. What could be better than simply mangos? Adding a pinch of saffron! Saffron is a mild, gentle, but flavorful spice that comes from a special orchid flower. It is used in everything from warmed bedtime milk, to Indian and Middle Eastern desserts to the famous Spanish Paella (it is what gives paella its bright orange color). Saffron and mango are buddies…they taste amazing together. Dissolve a few saffron threads in a few teaspoons of warm water. You will notice the color coming out. 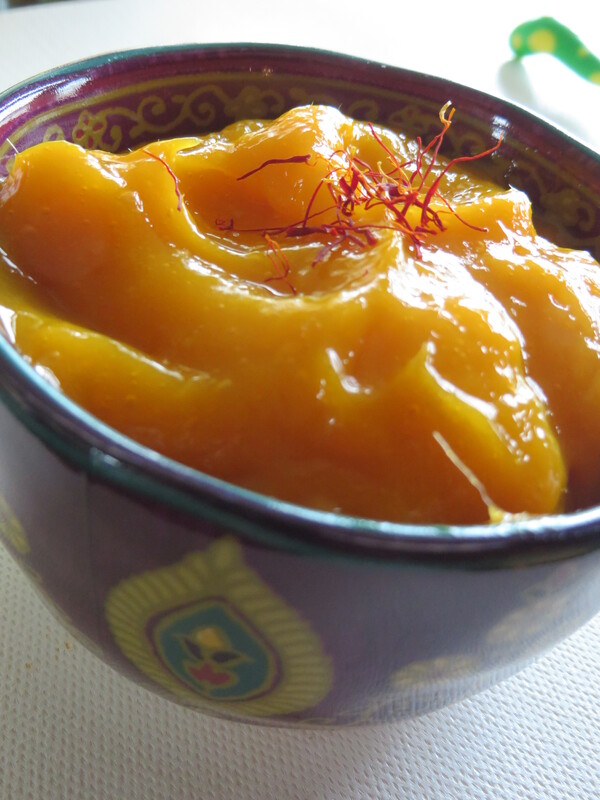 Add this to your mango chunks when blending and your puree will be imparted with a beautiful, exotic saffron perfume. It is a wonderful way to introduce your baby to a new spice. Kirina loved this as a baby and I can’t wait to try it on Ela when she is ready to start solids. 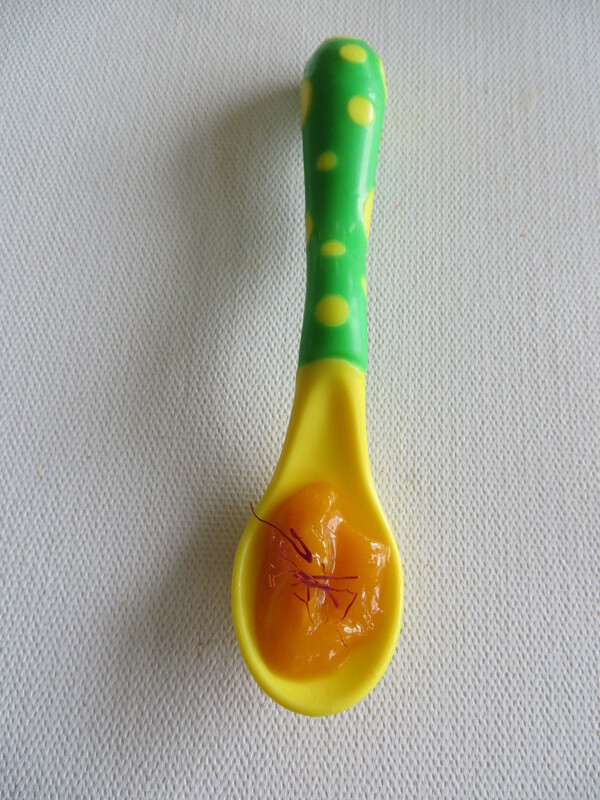 For toddlers, you can add the mango-saffron puree to a cup of yogurt in a bowl, or blend to make a smoothie. YUM! Keep those taste buds growing! With summer upon us and fruits coming into season it is a fun time to experiment and introduce new flavors to your little one. From Kirina’s high chair to your little one’s, bon appetite! « Have your taste buds grown up yet? Maybe one day they will!